The viewing experience on mobiles is never as great as on the large screen. Thanks to AirPlay, all the media contents supported by iOS devices can be streamed. This means that AirPlay can work across any apps and content that allows it. To AirPlay a video or music file, the content will be streamed from the iOS devices directly to Apple TV and played on the large screen, with full quality reserved. 5KPlayer allows wireless streaming of the audio and video contents on iOS devices like iPhone, iPad, iPod touch and Apple TV to Mac/PC, or from Mac/PC to Apple TV and other AirPlay-enabled devices for multi-screen display. Here come the guides of receiving and sending AirPlay stream, as well as setting and expanding the use of AirPlay. How to AirPlay videos in formats like AVI, MKV, DivX, MOV, FLV etc. from computer to Apple TV? The world-class 5KPlayer provides the top solution. 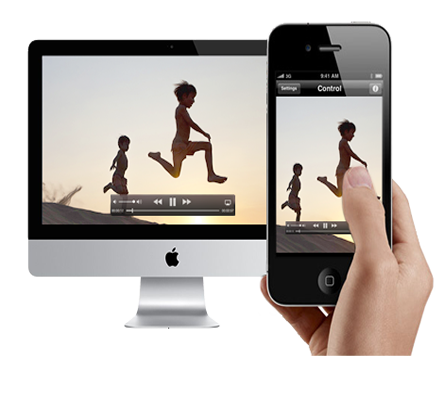 Wonder if you can stream video and audio from iPad and iPhone to Mac? 5KPlayer can help you stream videos, movies, music from iPad iPhone to Mac. Seeking for ways to stream film video from Mac to Apple TV with 100% quality reserved? Your search ends here as 5KPlayer, an unparalleled media player, offers the top solution to stream from Mac to TV with extremely high quality. How to AirPlay Video Music to Windows PC from iPhone/Mac/Apple Watch? Users can learn to AirPlay video music to Windows PC or tablet from iPhone/iPad/Apple Watch/Mac/PC with best free AirPlay PC monitor. Here are some tips for you to use 5KPlayer AirPlay to stream video from iPad iPhone iPod to MacBook Pro/Air or Windows 10/8/7 just a click away. The free media player plays everything, including MKV, M2TS, MP4, AVI, WMV, FLV videos and MP3, DTS, AAC, AC3, WMA, and FLAC&ALAC lossless audio files. How to make use of 5KPlayer AirPlay to stream MP3, AAC music from iPhone (6/6 Plus/5S/C) iPad (mini 3/Air 2) iPod Touch to Mac or Windows? This is for 5KPlayer AirPlay mirroring users to get the best way to mirror what's on iPhone iPad iPod to your Mac/Windows computer. Moreover, there are also some guides on the related top concerned and searched issues including how to download MP4 HD/4K 1080p videos, download music songs MP3 AAC FLAC from various online video music sites like YouTube and Dailymotion, and then how to play those SD HD UHD/4K videos and music media files on iPhone, iPad, Mac and Windows with the best media player. There are guides on how to free download 1080p MP4 HD/4K videos movies and MP3 music songs from websites such as YouTube, Facebook, Yahoo, Dailymotion, Break, CBS, Vevo, Vimeo, etc. The free media player plays everything, including MKV, M2TS, MP4, AVI, WMV, FLV videos and MP3, DTS, AAC, AC3, WMA, and FLAC&ALAC lossless audio. The guides here tell how 5KPlayer DLNA streaming function helps stream video music from Android/iPhone to PC and PC to smart TV, Xbox, PlayStation, etc DLNA-compliant devices. What is VLC? How to use VLC Media Player? Here is an overall guide on how to use VLC to play HD MP4 MKV FLV AVI MP3 etc files, download convert YouTube online videos and stream online media. Also, help you find VLC alternatives when VLC is not working.